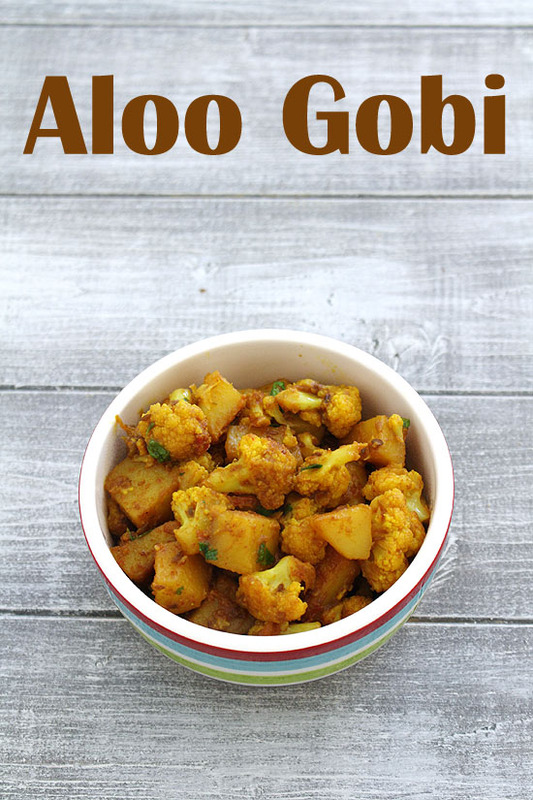 Aloo gobi recipe – a healthy dry vegetable preparation aka sabzi made from potatoes and cauliflower. This goes perfect with phulka roti. This is one of the healthy sabzi recipes that can be made on day to day basis. At home we love cauliflower, so I make it at least once a week. Cauliflower and cabbage are the two vegetables that we never get tired of eating. So this sabzi and cabbage sabzi are my go to recipes. This is not punjabi style aloo gobi recipe where onion tomato are sauteed first then mixed with potatoes and cauliflower. I do make that version once in awhile. But today’s sabzi is the SIMPLE and EASY made with minimal ingredients. Also this is no onion no garlic recipe. Here I have used very basic and few spices. No garam masala is added. With less spices, you will get the best flavors. So please do not overpower the taste with too many spice powders. Occasionally I add a handful of green peas into it for a change. 1) First wash, peel and cube the potatoes. Then cut the cauliflower into florets, keep them in colander and rinse them well. Let the excess water drain out. I like to cut them into small bite sized florets. Many prefer the bigger sized, it’s the personal preference. Just keep in mind that keep the potato cubes and floret size almost same, so both get cooked at the same time. 2) Heat the oil in a pan on medium heat. Once hot add cumin seeds and let them sizzle. 3) Then add ginger paste and green chili. 4) Saute for a minute or till the raw smell of ginger goes away. 5) Then add hing and turmeric powder. 7) Immediately add potato, gobi and tomato. 9) Add salt, red chili powder and coriander powder. 10) Again mix till all the spices are coated to the veggies. 11) Then cover with lid or plate. Make sure that lid has ½ inch high rim around the edges. Pour a glassful of water on the lid. Let the veggies steam cook. 12) Cook till they are soft and tender. Do stir once or twice in between. Make sure not to overcook it otherwise gobi will get mushy. 13) Lastly add squeeze the lemon juice. 14) Sprinkle coriander leaves and mix. It is ready to serve. If not serving right away then keep it covered till the time of serving. Serving suggestion: Serve aloo gobi sabji with phulka roti or paratha. Have some dal-rice, kachumber salad on side to make a complete meal. 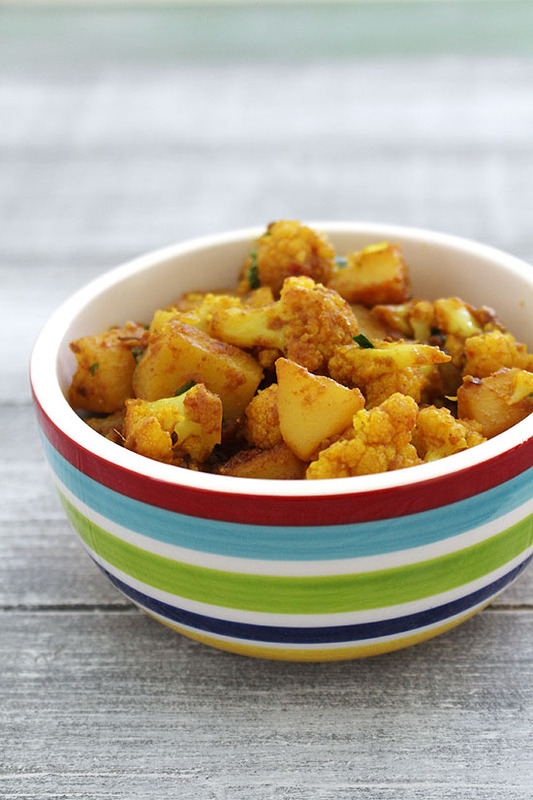 Aloo gobi recipe - popular Indian spiced cauliflower dish tastes best with roti or paratha. First wash, peel and cube the potatoes. Then cut the cauliflower into florets, keep them in colander and rinse them well. Let the excess water drain out. Then add ginger paste and green chili. Saute for a minute. Then add hing and turmeric powder. Mix into oil. Immediately add potato, gobi and tomato. Mix well. Add salt, red chili powder and coriander powder. Again mix till all the spices are coated to the veggies. Then cover with lid or plate. Make sure that lid has ½ inch high rim around the edges. Pour a glassful of water on the lid. Let the veggies steam cook. Cook till they are soft and tender. Do stir once or twice in between. Make sure not to overcook it otherwise gobi will get mushy. Lastly add squeeze the lemon juice. Sprinkle coriander leaves and mix. I love your recipes. i must try at home.